Saturday has always been reserved for errands. I don't remember when that started but I'm sure it had to do with the fact that I could leave my boys home with their dad and have a few hours of freedom. They would rather have the fun of running and playing than being confined to a car and restricted to their best behavior while out in public. And, they got to help Dad do whatever guy things he had planned for the day. The card I'm sharing this morning, before I run those errands, is a tribute to my three sons. It is also one I designed for our current llama blog hop. Christmas has always been celebrated with great joy in my family. Celebrating the birth of our Savior, Jesus, is the focal point but anticipating a visit from Santa was high on the list for my boys. They would hang their stockings, head to bed and be awake for hours too excited to settle down and sleep. Eventually, it would quiet down and Santa would make his appearance. Such fun and happiness. I loved it and I miss those days now that the boys are grown with families of their own. When I first saw the Holiday Mini Catalog and the Stitched Stockings Stamp Set and the Stocking Builder Punch, I knew I had to have them. 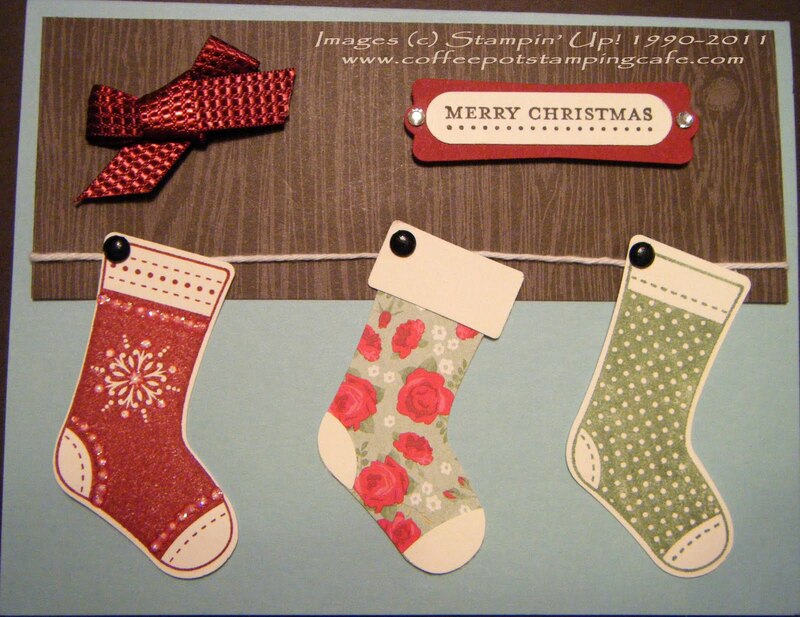 Now, I usually don't get excited about Christmas until after Thanksgiving, but this year Stampin' Up!® has too many fun Christmas products for me to wait that long. So, here is the card I made in remembrance of the three stockings that hung in my home when the boys were small. Okay, now that I have Christmas somewhat out of my system, I'm turning my focus to Thanksgiving. I have so very much for which to be thankful. How about you? What makes you thankful? Leave a comment and let me know. I would love to hear from you.